Featuring a sauna Northstar - The 9th Green Home is located in Polaris. This property offers access to a patio. The holiday home consists of 1 bedroom a kitchen with dining area and a bathroom with hot tub. A TV is provided. Reno is 37 km from the holiday home while South Lake Tahoe is 42 km away. 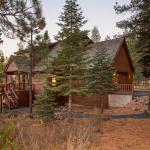 The nearest airport is Reno-Tahoe International Airport 38 km from Northstar - The 9th Green Home.